A French soldier walking away from the camera through an empty German trench, 1917. Photograph found in RG1/031, John C. Hanna Collection. 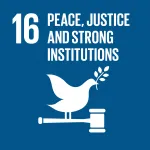 This image cannot be reproduced outside the guidelines of United States Fair Use (17 U.S.C., Section 107) without advance permission from the AFS Archives. 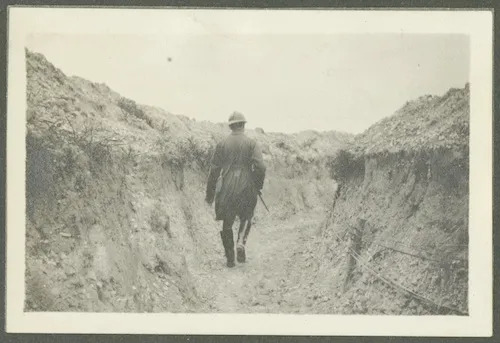 This photograph shows a French soldier walking away from the camera through an empty trench. 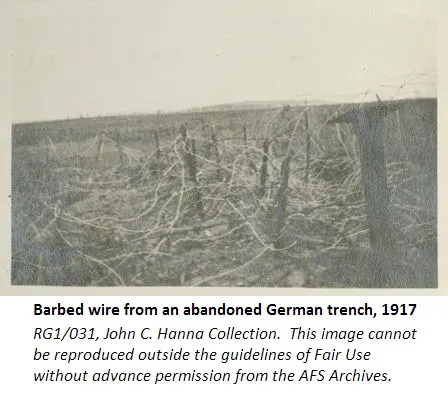 This image was taken in 1917, when French soldiers accompanied John C. Hanna and other ambulance drivers of American Field Service (AFS) Section Sanitaire [États-] Unis (SSU) 1 to explore the trenches that had formerly been occupied by German troops. They discovered discarded mortars, old barbed wire, a trench gate, and an abandoned dugout. AFS Drivers were not expected to be in the trenches during battles; rather, brancardiers (French stretcher-bearers) would carry wounded soldiers from the trenches to a poste-de-secours, where they would then be loaded into the AFS ambulances. 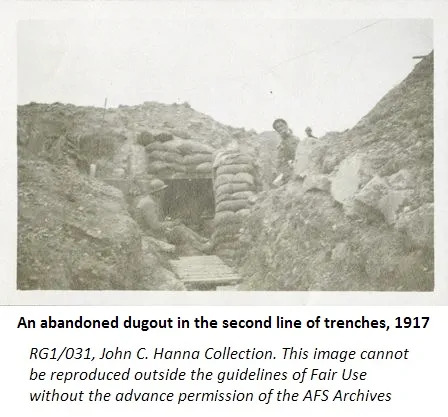 While this photograph depicts a somewhat tidier trench due to its abandoned state, World War I soldiers were often exposed to very unsanitary conditions on the Western Front. Trench warfare was implemented due to the advances in firepower and related technology, which were not matched in similar advances in mobility and military strategy. 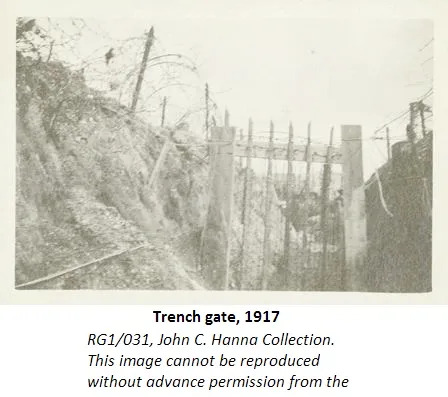 Trenches were built at right-angles in zigzags to better contain artillery blasts, and some included dugouts, which were protective spaces in the trenches intended for command posts, first aid stations, or sleeping quarters. Other common protective features of the trenches included sandbags and barbed wire. 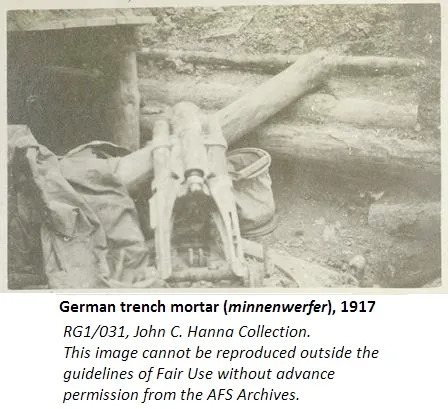 The trenches often became muddy and unsanitary, leading to its occupants suffering from infections and fungal conditions, including the dreaded “trench foot” that affected a large number of soldiers. During many long campaigns or battles there could also be remnants of the bodies of dead soldiers that had not yet been removed, leading to infestations of rats.